As far as the terrain is concern, Bhutan is similar to Sikkim and Darjeeling but that is where the similarity ends. Bhutan, with Thimphu as its capital, is an independent kingdom and a member of the UNO. Culturally and ethnically, it is also slightly distinctive, having more of a Buddhist population who speak a language called Dzonkha, which is similar to Tibetan. The Drukpa Karugpa system of Buddhism is the religion that is by and large being followed by Bhutan. Bhutan is a landlocked country surrounded in the north by Tibet, south by West Bengal and Assam, east by Arunanchal Pradesh and west by Sikkim and Tibet, roughly the size of Switzerland, in the eastern Himalayas. More or less rectangular, 145 km by 305 km, Bhutan has an area of 46000 sq. km. With the population of just about 1.2 million, it is perhaps one of the least sparsely populated countries in the world. The southern foothills, at an altitude of 1,000 ft to 4,500 ft are covered by dense tropical forest, which abounds with wildlife. These regions are mostly inhabited by Lhotsampas (Nepalese immigrants who are given Bhutanese citizens nationally) and most of them are agriculture workers. Most industrial areas are also located in southern region. The fertile central valleys (3,600 - 8,500 ft) are covered by verdant coniferous and deciduous forests and dotted with numerous monasteries, temples and dzongs. Western Bhutan's major valleys of Ha, Paro, Thimphu, Punakha, Wangduephodrang are intensely cultivated. The people in these valleys are well to do and they build large homes of rammed earth in which several generations often live together. The formidable Black Mountains, rising to over 16,000 ft forms a natural boundary between Western Bhutan and Central Bhutan. Central Bhutan is made up of several districts where different dialects are spoken. Khyeng, in the south, is covered by semi-tropical jungle and is famous for its bamboo and ratten ware. Further north is Trongsa, home of one of Bhutan's most impressive dzongs. Bumthang's four valleys, between 8,530 - 13,000 ft with their picturesque countryside, beautiful coniferous forests and numerous Religious sites are often known as the "Heart of Bhutan". Eastern Bhutan, home of the Sharchops ("people of the east"), is generally warmer. The eastern women are renowned for their weaving skills and produce fine textiles of silk and cotton. Northern Bhutan, lying largely above 11,500 ft is region of glacial valleys, alpine meadows and is home to the semi-nomadic yak-herders of Lingshi, Laya and Lunana, have almost no contact with Western civilization and trade only in bartered goods. Towering above this magnificent trekking country are the eternal snow-clad peaks of the majestic Jhomolhari, Jichu Drake and Gangkar Puensum, rising to over 23,000 ft. The climate varies widely depending on the elevation. In the south, it is tropical; at the northern extreme, there is perpetual snow. Very little rain falls in the autumn from October through December making it ideal for trekking. The early history of Bhutan is not well documented. It is shrouded in the mists of Buddhist tradition and mythology. The most important events of the period involved the saints and religious leaders who were therefore chronicled only in scriptures. Unfortunately due to the natural calamities like earthquake and fire, most of these original documents were destroyed and much of this early history relies on reports from British explorers, and on legend and folklore. Archaeological evidence suggests Bhutan was inhabited as early as 1500 BC or possibly even 2000 BC. These early inhabitants were followers of Bon, an animistic tradition that was the main religion of the Himalayan region before the advent of Buddhism. Though Buddhism was introduced as early as the 2nd century, the first Buddhist temples were built only in the 7th century during the reign of the Tibetan king Songtsen Gampo in which era the influence of Tibet began to spread to Bhutan. However it was only with the first visit of Padma Sambhava or Guru Rinpoché to Bhutan in the 8th century that Buddhism was truly introduced to Bhutan. Between the 9th and 17th centuries numerous ruling clans and noble families of Tibet settled in different valleys throughout Bhutan following internecine strife in Tibet. It was during this period that the Bhutanese variety of Buddhism, the Drukpa Kagyup, established itself in Bhutan after escaping persecution at the hands of the Gelugpas. By the 16th century, a noble man from Tibet named Drukpa Rimpoche came to this area and started the process of spiritually consolidating the various tribes. A proper Kingdom of Bhutan was then established by him and he came to be known as Shabdrung Ngawang Namgyal with the title of the Priest King. He established his capital of Punakha and built many Dzongs or forts, which have still survived the vagaries of time. He devised many of Bhutan's customs, traditions and ceremonies to forge a unique cultural identity distinct from Tibet. Following the Shabrung's demise, which was kept secret for more than 50 years, the country fell apart in the throes of civil war. This fractious state of affairs continued for centuries till the modern period was initiated at the onset of the 20th century with the installment of the Trongsa Penlop as the first hereditary monarch of Bhutan. Tsechus mainly comprise of mask dances in addition to some folk dance entertainment in between. Festivals are not pageants or entertainment events and definitely not held as tourists’ attraction. They are genuine manifestations of religious traditions thousands of years old, which outsiders are given the privilege to attend. 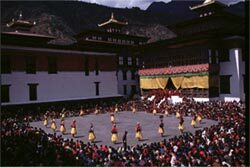 This festival is held in Thimphu, Paro and Bumthang. They mark the busiest time of year for the tourism industry. Airplane tickets and hotel rooms are frequently difficult to come by. Tourists are allowed into the dzongs to watch the festivals, but are not allowed into the inner sanctuaries. Photography should always be done in a discreet and respectful manner, befitting the religious occasion. It is generally allowed for photographs to be taken at tshechus but not at dromchoes. The Royal Government of Bhutan has adopted a very cautious approach to the development of tourism in the kingdom in an effort to avoid the negative impacts of tourism on the culture and the environment. Visitors to Bhutan must either be guests of the government or tourists. All tourists (group or individual) must travel on a pre-planned, prepaid, guided, package tour, or custom designed travel program, for which there is a fixed tariff set by the Royal Govt. This tariff includes the services of accommodation & meals, transport & Guide, sightseeing and entrance fees. INDEPENDENT TRAVEL IS NOT PERMITTED IN BHUTAN. The only airport is at Paro. Bhutan's national airline, Druk Air, is the only airline servicing Paro. It has connections with Delhi via Kathmandu on Mondays and Thursdays. You can enter Bhutan from Delhi and Kathmandu on Mondays and Thursdays; Bangkok and Calcutta on Wednesdays, Fridays and Sundays. Flights leave Paro for Delhi and Kathmandu on Mondays and Thursdays; Bangkok and Calcutta on Tuesdays, Thursdays and Saturdays. NOTE: During monsoons, unpredictable weather forces can delay flights and travellers are advised to include an extra day in their itinerary. The road from Bagdogra (the nearest Indian airport) enters Bhutan at Phuentsholing, the border town. It is a 3-4 hour drive from Bagdogra airport, which can be reached by plane from Calcutta and Delhi. From Darjeeling or Gangtok (Sikkim), it can take 7 hour to Phuentsholing. It takes approximately 6 hour from Phuentsholing to Thimphu or Paro. NOTE: Entry / Exit one way has to be by air. Valid passports and an entry visa are essential. Travelers to Bhutan are permitted only as a member of a commercially organized tour group. All visitors to Bhutan must have a visa approved prior to arriving in the kingdom. Those who have not had a visa approved will not be permitted to board their Druk Air flight to Bhutan. A two-week visa costs $20 USD and is stamped in your passport at Paro Airport during the immigration process. Visas are approved and issued prior to entry, with the prepayment of your travel itinerary. Therefore visitors to Bhutan need to finalize their travel plans well in advance. This can be done directly through us. The price for any holiday is set by the Royal Government of Bhutan and it covers all accommodation costs, all meals, transport, services of licensed guides etc., as mentioned earlier. There are surcharges on individuals and groups of less than three people. There are also discounts available for young students and children. Visa clearances are issued by the Ministry of Foreign Affairs in Thimphu and must be obtained before departing for Bhutan. Druk Air tickets cannot be purchased without visa clearance. At your port of entry (either Paro Airport or Phuentsholing (land entry or exit)), your visa will be stamped in your passport on payment of US$ 20, you will also require two passport photos. The Bhutanese authorities strictly monitor the export of any religious antiquities or antiques of any kind from the Kingdom (100 years or older). Visitors are advised to be cautious in purchasing old and used items. Custom authorities will not allow items to be taken out of the country if they have not been officially certified as non-antique. Personal videos, cameras, personal computers, portable telephones or any other electronic device should be registered with the customs authorities on arrival at Paro and will be checked by the same on departure. Upon arrival you will be issued a "customs form" this form must be filled out, with declarations, and returned to authorities before leaving the kingdom. Import of plants, soils, etc., are subject to quarantine regulations. These items must be declared on arrival. Bhutanese currency is the ngultrum (nu). 100 Chetrum = 1 Nu. The approximate exchange rate is 45.00 nu for one US dollar (this will vary 1 or 2 nu, plus or minus) The ngultrum is on par with the Indian Rupee (both the Nu and Indian Rupee can be used in Bhutan). US Dollars and other world currencies as well as traveler's cheques can be exchanged at banks in the larger towns (hours 10:00 am to 1:00 pm, Mon to Fri) and at the larger hotels. In the capital town of Thimphu some of the smaller bank branches are open Saturday and Sunday for currency exchange. Ngultrum or rupees will be what you will need for your purchases while in the more rural towns and villages. Visa and American Express credit cards are accepted in a few shops, but their use is limited. Travelers cheque are accepted in most places. There are comfortable hotels and lodges at all tourist destinations. Western Bhutan has better hotels while in Central and Eastern part of the country, accommodation establishments are simple and offer minimum facilities. There is no star categorization of hotels here and five star luxuries are not available. Hotels in western towns; Thimphu, Paro, Punakha are well developed providing decent accommodation and cuisine. However when one ventures into central and eastern region, the lodging gets more rudimentary. Even when you travel to remote areas of central and eastern Bhutan through us, you can be sure that your accommodation in lodges, guesthouses, smaller hotels and tented camps will be of an approved standard. Most of the hotels and guest lodges are now equipped with international direct dial telephones and fax machines. International Direct Dial calls can be made to or from Bhutan to anywhere in the world. We have carefully selected the accommodation units with the best of location, service and ambience. Adventure Silk Road uses the best establishments available. Although the best units cannot be compared to International standards but still they offer the necessary facilities. Situated conveniently in the heart of city or around the spectacular landscape, and built in traditional design, the units are well maintained. Sometimes the best hotels maybe the only establishment which may be very modest. In these cases, we feel that inconveniences are outweighed by unforgettable experience of these more remote areas. Spicy chilies (ema) mixed with a cheese sauce called emadatse is the national dish of Bhutan. Chilies are treated as a vegetable rather than a seasoning in the Bhutanese diet. A wide variety of fresh vegetables are a daily staple of the Bhutanese diet. Red and white rice are served at all meals. Meats, poultry and fish (usually in the form of stews) are also found on many Bhutanese menus along with Tibetan momos and noodle dishes. Bhutan's professional chefs temper their natural tendency to over spice dishes by preparing food more suitable to western taste ranging from Continental to Chinese, Japanese, Bhutanese, Tibetan and Indian cuisine are also available. Southern Bhutan has tropical climate, the central valleys of Punakha, Wangdiphodrang, Mongar, Tashigang and Lhuntshi enjoy a semi-tropical climate with very cool winters while Thimphu, Tongsa and Bumthang have a temperate climate, with monsoon rains in the summer and snow-fall in winter. Winter in Bhutan begins from mid-November and ends in mid-March. At this time of the year, the climate is dry, with daytime temperatures of 16-19 degree centigrade (with sunshine and clear skies) and nighttime temperature falling below zero. The monsoon usually arrives in mid-June, with the rain falling mainly in the afternoons and evenings. At the end of September, the rains cease and autumn suddenly arrives bringing in the best time of the year for trekking which lasts until mid-November. Due to wide range of temperature and climate conditions, it is advisable to bring appropriate clothing. For protection against cold; layered clothing is better than a few thick ones, so choose your cloths accordingly. Cloths should be preferably be made from natural materials which allow the body to breathe better. You will be offending people if you walk around in skimpy or tight fitting clothes. Although there are normally opportunities to wear shorts, we would advise women to wear shirts or loose trousers, men should not wear singlets. During visit of monasteries, Dzong and the other religious institutions you should not wear shorts, hats and should be properly dressed. Mode of transportation within Bhutan is by motor vehicles only. There are no domestic airlines or trains. However the main roads are well maintained. The main two-lane highway runs from west to east connecting all the major towns and villages. The mountainous terrain and winding roads restrict the average speed of vehicles to less than 40 km per hr. During monsoon and winter months, weather can disrupt travel and unexpected changes might occur in itineraries. Every effort will be made to stay as close to original travel itinerary as possible. For visitors wishing to enter Bhutan by road, the only land entry point is though the southern boarder town of Phuentsholing, bordering West Bengal India. Adventure Silk Road uses the best available modern transport in the country: Toyota cars, Land Cruisers, Hilux, Haice buses & Coaster buses. For all tours booked through Wind Horse, separate transport and guide are provided whether FITs/GITs. Anyone who enjoys outdoor life and is physically fit can participate in our treks and tours. However some treks may be rigorous and difficult because of high altitude and therefore a good training of fitness for at least a month at home is required for treks going to an altitude in excess of 4000mts/1500 ft. There is no compulsory vaccination for travel to Bhutan or within the continent. However it is recommended that you are protected against Polio, Tetanus, Typhoid, Cholera, Hepatitis A, Malaria, especially if you are traveling out of Bhutan. If you have heart condition, please check with the doctor to ensure that it is ok to undertake high altitude treks. When traveling anywhere in the subcontinent, it is imperative that you have full comprehensive insurance cover to protect against unforeseen accidents and mishaps. Such policies are not available in Bhutan. It should adequately cover baggage, travel delays, helicopter evacuation, transportation and medical assistance incase of treks. Traditional handicrafts, textiles, jewelleries, baskets, mask. Paintings and woodcarving make good buys. Kuensel, the national newspaper of Bhutan is published weekly in three languages, Dzongkha, English and Nepali. Well written and highly informative. Kuensel does a great job keeping its Bhutanese and international readers up to date on the politics and current events in the kingdom. Kuensel. 220 Volts, 50 cycles A.C. current is available. And electricity in Bhutan is reasonably reliable, but we advise you to bring a small surge protector for delicate electronic equipment. In many parts of Bhutan electricity is generated through hydro electricity, either from larger projects, such as Chukha dam, or mini hydro plants. Bhutan standard time is 6 hours ahead of GMT. Bhutan time matches with Bangladesh time. Reliable telephone and fax services are available in all towns in Bhutan. International connections are excellent. Now internet and e-mail facilities are also available in most of the places. The photographic opportunities on all trips are immense. You will also wish to record the local people, their houses and shops, etc. You can always ask by gesture, if it is ok to take pictures. Don’t take your destination as a living museum. Also while visiting Dzongs, Monasteries and religious institutions, please follow your guide’s instruction carefully. Dzongkha, the language of the western region, is the national language. English is the medium of instruction and is spoken by all government officials and businessmen. Nepali is prevalent in the south while Bumthangkha, Khyengkha and Sharchopkha are common dialects. Our guides and few staff are trained to speak Japanese, French and little Spanish.